If you feel like you’ve done everything there is to do in Byron Bay, Graham Simmons says think again. His ten best insider secrets will allow you to see the iconic destination in a new light, and pass yourself off as a local at the same time. Just a ten minute walk from the Byron CBD, the Cumbebin Wetland Sanctuary is a pocket of rejuvenated paperbark wetlands hidden behind the Butler St market grounds. Volunteer labour has transformed this reserve from a lantana-ridden wasteland into a sheltered haven for birdlife and frogs. Bangalow palms and birds-nest ferns proliferate among the shallow lagoons. The boardwalk, with seating looking out over the wetlands, is perfect for a stroll or a picnic lunch – and during the height of summer offers cool respite from the heat of the day. Local publican and ex-rugby league great Tom Mooney owns a string of watering holes throughout northern NSW – but you’ll rarely find him drinking anywhere but at The Rails. The same applies to Byron locals. And the reason is clear – The Rails (aka the Railway Friendly Bar) is unique. For well over 80 years, the Railway Friendly Bar was a thirst-aid stop for weary travellers arriving in Byron. But when the North Coast Casino to Murwillumbah branch rail-line was put in mothballs back in 2004, so was The Rails. The pub, with its rustic iron roof, open drinking spaces and miniscule kitchen from which miracles emerge, is not allowed to be altered, refurbished or extended in any way whatsoever. The result is a classic pub with no peer. Anybody who is anybody (and many who aren’t) all meet at The Rails – particularly on Friday night, which is “locals’ night”. Free live music is a drawcard too – from 7pm or so every night of the week. And when the bands wind down, other places (such as Liquid Bar, started by a group of Byron Bay musos who became disenchanted with the takeover of local nightclubs by out-of-town promoters) are just opening up. When loggers clear-felled “The Big Scrub” of northern NSW for the valuable Australian Red Cedar tree from the mid-1800s right through to the banning of logging in 1982, the native Bundjalung people displaced from their traditional homelands retreated to the few remaining pockets of untouched rainforest. One of these pockets, a luxuriant swathe of Bangalow Palm forests and spectacular waterfalls, was a sacred place to the Widjabul clan, and is today known as Nightcap National Park. Its survival is largely due to the efforts of protestors (hence the name) who put a halt to logging operations along Terania Creek in 1979. The Falls are among Australia’s tallest and most spectacular, and lie along the outstanding Protestors Falls trail – an easy walk of about 1.5km return, partly along a boardwalk, which begins at the Terania Creek picnic area about 15km from the village of The Channon. Following heavy rains in 2008, the forest floor is a carpet of newly emerging Bangalow Palms. And the Falls themselves are scenic enough to justify any number of return visits. Zentveld’s has become the caffeine purveyor of choice at the highly acclaimed annual Byron Bay Writers’ Festival, the only known place where writers’ block comes rated at SPF15+. Coffee, Byron Bay-style, takes on a quality all its own. In the hinterland behind Byron Bay, more than 150 boutique coffee orchards have been established since 1990, with a total output of 120 tonnes by 2003. That’s been forecasted to rise to around 700 tonnes by 2010. Most overseas coffee is grown in the tropics, at an altitude of more than 1000m. In the Northern Rivers, by contrast, most of the plantations are at around 200-300m above sea level. “But what we lose in altitude, we make up for in longitude,” says Rebecca Zentveld, of Zentveld’s coffee plantation near Newrybar. The company also sources a good proportion of its beans from northern Qld, thus obtaining a blend with good body. Zentveld’s has become the caffeine purveyor of choice at the highly acclaimed annual Byron Bay Writers’ Festival, the only known place where writers’ block comes rated at SPF15+. Not all Northern Rivers coffees are grown at low altitude. John and Effie Vikas, of Clunes Country Coffee, comparatively high on the Bangalow-Lismore road, produce a rich blend from locally grown beans (with a very pleasant onsite café an added bonus). Equally good blends come from neighbouring growers Bangalow Coffee and Nashua Coffee at (where else) Nashua Road, Nashua. Between Newrybar and Suffolk Park, a roadside stall at Broken Head Road Coffee Plantation offers just-roasted coffee to passers-by. Marketed as “organically grown, hand-picked and sun-dried,” help yourself to freshly roasted beans or ground coffee from an honesty box, and leave money in a little tin. How low-tech can you get? That’s Byron all over. Just west of Main Beach, looking across Bilongil Beach towards Mt Warning. The Belongil precinct is home to some of Byron’s top beachside dwellings, the ambience of which is disturbed only by frequent disagreements with the local council over residents’ rights to build sea-walls to protect their valuable properties. But there’s one place not subject to tidal or political erosion: Belongil Creek (or, more properly, Belongil Estuary). You can launch a kayak near the Belongil Beach Resort and kayak a few kilometres inland (depending on tides), past scenic wetlands and through rural landholdings that, funnily enough, still exist in today’s holidaymaker-fixated Byron Bay. Arakwal, one of the newest national parks in NSW, was opened and dedicated by Arakwal tribal elders in 2001. The easiest access is via Ironbark Avenue – take Bangalow Rd towards Ballina, then turn left into Ironbark about two klicks south of the Byron Bay CBD. A walk through pristine bushland leads past a sandblow (veer hard left, or you’ll lose the track) to Tallow Beach. Exercise care if swimming at Tallows, as the beach is unpatrolled and subject to dangerous rips and undercurrents. Opposite the golf course, a bike path also leads through the Arakwal wetlands to another section of Tallow Beach. The wetlands here are at their most scenic after heavy rains. An enthusiastic busker at Bangalow Market. Organic sourdough breads; Bangalow farm cheeses; organic veggies; pecan nuts from the Nimbin Valley; Dunoon macadamias; Tweed Valley beef; fresh Brunswick River whiting and prawns; these local delicacies and more are on sale every Thursday morning at the Farmers’ Market on the Butler St Reserve. Official hours are 8-11am, but locals get there from 6:30am onwards, with onsite coffee stalls making the gathering something of a social event. The only downside is that high stall rents tend to force up prices; so for cheaper produce you may prefer to shop at the fruit stand outside the caravan park on Ballina Road (opposite Byron Bay Golf Course). Bangalow could be light years away from Byron Bay, its proximity (just 7km) to Byron notwithstanding. The scenic Old Bangalow Rd winds up through the hills behind Byron Bay, twisting and turning upon itself like an itchy snake. Drivers have to be super-careful to avoid gawking at the spectacular scenery to the detriment of their road-handling capabilities. By contrast with Byron Bay, Bangalow seems quieter than a country cousin on Serapax – except, that is, on market day (last Sunday of the month), when bumper-to-bumper traffic clogs the narrow streets. On all other days, the visitor has free rein to browse, graze and check out the many antique shops and cafés that make Bangalow just a cut above its brash lowland neighbour. Take time to peruse the eclectic merchandise of the Wax Jambu Emporium, the clothing at Don’t Tell Mama, or the fine “Antiques for the People” at Mostly Mao. The Bangalow Historical Museum is also well worth a visit. Later, adjourn for a coffee at the Utopia Espresso Bar, which delivers a super-charged brew made from its own special blend of Zentveld’s. Even those with only a few days to spend in Byron are invariably mesmerised by the beauty of the place. The beaches are outstanding – for starters, try surfers’ favourites Watego’s Beach or The Pass – but for sheer quietude, you can’t beat the ambience of Broken Head Beach. Like many other visitors, one of the first things I did upon arriving in Byron was take a surfing lesson. Max Perrot of Above Board in Lennox Head (02 6687 7522), about 20min south of Byron Bay, specialises in showing mature-age people how to surf. He guarantees to get you standing up on your first lesson – but that’s no guarantee you’ll be able to replicate the feat later on your own. 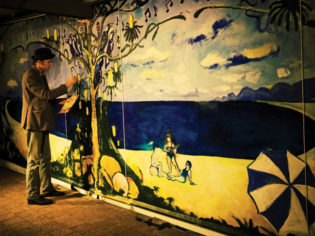 The day-visitor or holidaymaker in Byron rarely gets the chance to see creativity at work. The beaches and cafés are too alluring, and the often-tacky shops and galleries in the main streets give only the merest hint of the creative buzz of the town. To track down Byron’s “Creative Class”, trek out to places like Byron Bay’s Arts and Industry Park (formerly the Arts and Industry Estate), about 3km east of town. 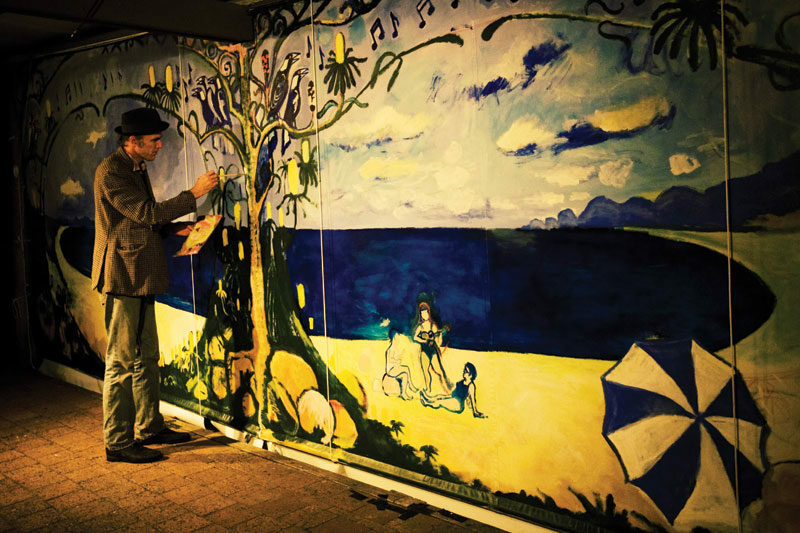 The Arts and Industry Park Guide (available at the Byron Bay Tourist Office, near the railway station) lists well over 50 creative enterprises with shopfronts in the Park. Their wares are on sale at a fraction of the price you’d pay in Byron’s main street. But, this being Byron Bay, some of the claims to artistic street-cred ring just a little hollow; for example, the claim of one craftsperson to be Australia’s only architect/stonemason should be taken with a grain of silica. When folks talk about Scuba diving in Australia, they automatically think Great Barrier Reef. I went with one of the local operators to Julian Rocks, just offshore and had one of my best dives ever. Tons of marine life including moray eels, Steve Irwin-sized stingrays, Grey Nurse Sharks, a turtle, big fish like wrasse and grouper and funny little buggers like leopard sharks and wobbygongs. Brilliant. Oh, and the restaurant at The Byron at Byron is now open to the public. Lovely article and many good spots mentioned, thank you for taking the time to compile such a list. I might point out though (purely as constructive criticism due to severe personal disappointment after reading the article), your list of “secret” things to do in Byron includes the most well-known licensed venue in the town (right outside the visitors centre) as well as taking surf lessons (In one of the most well-known surf towns) and going to the WEEKLY farmers market. You guys should either rename the article or get to know your town better. I’ve lived here for over a year now and I’m pretty sure I discovered most of those places and activities in the first 48 hours without doing any specific searching or having any prior knowledge of the Bay. There are a couple of spots I didn’t know about on the list but the others are full-blown tourist attractions that EVERYONE (tourists included – I live with a lot of backpackers) all know about. I don’t mean to be contrary or negative towards your otherwise well-written article however if you’re going to be responsible for giving out information about our beautiful local area to the masses, please be accurate and don’t give them the impression that some of these “secret things” are anything more than well-advertised activities and places that can be found right in town with no research whatsoever and thus don’t deserve a place on a list of “secret things to do in Byron”. Thanks for your feedback. Yes, these are probably not as secret as they were when the article was written back in 2009. We are due to cover Byron Bay again soon so we look forward to some suggestions from you.